The modern auto dealership — marked by drive-in service areas, well-appointed waiting areas, and high-tech touches — have become standard in the industry, and Ford demands no less of its showrooms. Marcotte Ford, with a 50-year history on Main Street in Holyoke, was especially in need of such a makeover, and the family that owns it is set to unveil its new HQ this summer, bringing the company’s look and feel firmly into the 21st century. 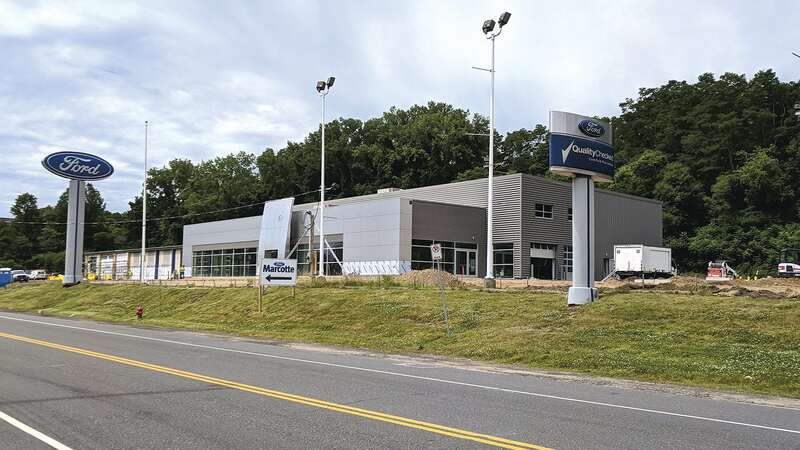 When Marcotte Ford reopens its dealership on Main Street in Holyoke this summer — after a year spent in temporary digs across the street — it will be the culmination of two complementary visions: Ford’s on one hand, and the Marcotte family’s on the other. “It’s been a long, long road to get where we are today,” said General Manager Mike Filomeno. “Obviously, Ford has a rebranding and a new look that they want, to refresh the whole facility and make it more customer-friendly. Then there are all the touch points we’re going to have — a brand-new shop, all-new equipment, indoor delivery areas for the customers to pick up their cars, all kinds of new technology to make the experience more user-friendly. What both Ford and the Marcotte family are looking for is the fulfillment of two goals that seem contradictory, but really aren’t, and are being reflected in dealership remodels across all brands: to make it easier and quicker for customers to get in and out when buying or servicing a vehicle, but also making the space more welcoming during the time they have to be there. To get to that point, Marcotte has spent the last year doing business across the street, in the former location of Gary Rome Hyundai, which relocated to a much larger lot on Whiting Farms Road in 2016. It’s been cramped, Filomeno said, but much better than working out of temporary trailers. To ease the burden on a smaller service area, Marcotte has sent much of its heavy-duty repair work down the street to its commercial truck center, which opened in 2015. Come this summer, the year spent in cramped quarters will have been worth it, Filomeno said, with the opening of the 40,000-square-foot, $8 million facility, which will include a 24-bay service area, including a dedicated space for vehicle inspections. As for the former Rome location, it will become Marcotte’s commercial-sales location, bringing to four (along with the neighboring Paper City Car Wash) the number of Marcotte-owned properties along a half-mile stretch of Route 5. Doing all that will be easier in the redesigned Marcotte Ford headquarters, which reflects the types of features Ford demands in all its new stores, Filomeno said. On the service side, customers have long been able to get a loaner vehicle when they bring their car or truck in for service, and Marcotte will continue with that service, he added, while employees will appreciate the state-of-the-art, climate-controlled shop decked out with new equipment. The company is especially excited about LugNutz Café, a restaurant that existed in the former building, but will be significantly expanded in the new one. LugNutz Café initially served breakfast two days a week for employees and customers, but will be expanding to breakfast and lunch six days a week, featuring sandwiches, wraps, soups, pizzas, and breakfast items like omelettes. Company President Mike Marcotte said customers will appreciate the new touches, from the drive-through service lane to interactive screens in the sales offices to help them quickly access information. Marcotte expects to unveil its 40,000-square-foot renovation in August, followed by a September grand opening. Filomeno said the dealership aims to be different because other Ford dealers have a similar look. “So we’re making it our own with the LugNutz and some of the other things we’re doing to make ourselves stand out. Marcotte agreed. “We feel like buying a car should be a fun experience, not stressful, even though it’s most people’s second-biggest purchase after their house,” he said. It’s also a different sales experience than it used to be, thanks to the internet. “People do a lot more research before coming in, before they even contact us,” Marcotte noted, noting that the visit is still crucial, because vehicles today are so loaded with high-tech safety equipment and other features that customers still want someone to demonstrate everything they might be able to utilize. Marcotte’s grandfather, Al, opened his namesake dealership in 1961 at a different site in Holyoke before moving to its long-time location on Route 5 in 1967. Bryan eventually joined the team, followed by Mike a generation later. 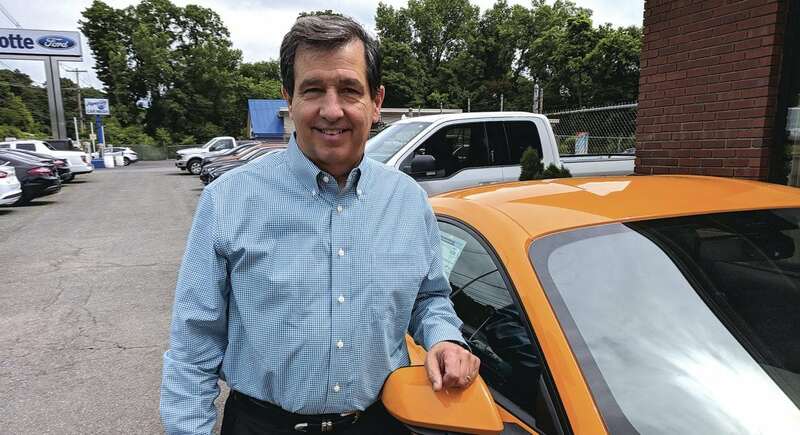 Today, the dealership employs a number of other family members, including Filomeno, who married into the Marcotte clan. It’s a company with not only family ties, but deep community roots as well, Filomeno said, noting that Marcotte Ford has supported a number of local nonprofits over the years, from Kate’s Kitchen and Providence Ministries to the baseball teams customers’ kids play on. With a 56-year history behind it, Marcotte said, the dealership felt it was past time to make the changes almost ready to be unveiled across the street. “We’ve been looking at this for several years,” he said, noting that it’s a good time to reinvest, with sales — particularly the truck business and the commercial side — booming. “Business has been good. We’re just always trying to find ways to find more business,” Filomeno noted, adding, however, that he’s unsure how people will react to Ford’s decision to discontinue some lines. Meanwhile, people’s driving habits are different than before, with younger drivers more willing to rideshare and use public transportation — not to mention the prospect of autonomous cars, which may someday significantly impact people’s decision to even own a car. So it’s important, he said, for dealers and manufacturers to anticipate possible trends while continuing to focus on what they do well. With 142 team members across all facets of the company, there’s been plenty of adapting and moving around while the main site has been given over to construction over the past year, Marcotte said, adding, however, that employee morale has remained high during the transition. That’s important, Filomeno added, because, while the internet has helped the company sell outside the local market, it’s still a company built on customer service.